I’ve got grand plans for my asparagus patch this year. I want to pick albino asparagus – the fancy white stuff that’s prized in parts of Europe. Last year I interviewed local asparagus growers to find out how to do it (I wrote about it for Lifestyle Block magazine; click here to read the story), so this weekend’s top task is to convince my husband to build a blacked-out temporary tunnelhouse over the top of a few of our rows. How hard can that be? well Lynda – hmmmmmm I poked around and think the culprit is either birds or a river rat.. we caught that critter (the rat) this morning as our compost bins aren’t too far away from our asparagus bed… found some roots and one teenie weenie little bud, so tenderly poked it back in and lovingly told it to grow big and strong so i could eat it!! so fingers crossed, maybe come Christmas?!!!! … We are right next to a river, so have to share river rats with our five compost bins. BUT my apple blossom is just pinking up on it’s tight little buds, and my dwarf peach trees are full of flowers as is my Hawera plum, so fingers crossed if I don’ have asparagus this year, then next year I shall put a bit of netting over my asparagus bed… BTW.. it’s almost IMPOSSIBLE to buy tins of asparagus here in Waikanae… been out of stock for yonks… any ideas on that??? Love your programme with Kerry (or Wendyl) on radio too…. love to hear all about Lucas and his mega dad. Jealous! I planted 8 two years ago upside down!, With the assisitance of my mother in law I put them the right way up, the first year 4 flowered last year 1 and this year not looking very good however…. I see peonies beginning to poke their beautiful little noses out. Hoping they will be in full bloom for the birth of baby #1 mid November. That explains a rather strange spear I saw today when poking around in the asparagus bath to see if any had come up yet. The top part was quite purple and the bottom part was white, and it tasted like eating a pea pod. I had no idea there was any other type but the green ones, oh well never mind. This is their 3rd year and I’m hoping to be rewarded for my patience as I followed the advice and left them alone for the first 2 crops. The purple variety is supposed to be more tender than the green. I wondered if it would turn green when it was cooked, the way purple beans do, but my single spear to date held its colour. Good luck with your harvest! Isnt it great being able to get out into the garden now the weather is fine enough. I would love to grow asparagus but my garden is now chocca and there is only room for the capsicums and carrots to go in. Today I planted out some dwarf butter beans, snow peas, broad beans, dwarf peas, pompom carrots, lettuce, rocket, two good size Roma tomatoes, now I am just waiting for the cherry tomatoes to sprout from the ones I left last year and the zuccinni which I buried at the end of last year (end of summer I let one get very large then cut it into 4 and bury the bits around the garden and come spring they sprout seedilings for me. My favourite though is the lovely large Black Krim tomoatoes, One slice sits neatly on my morning vogels with salt and pepper. I let a couple of fruit drop again last summer and am hoping to get seedlings again this year. ‘Black Krim’s a goodie isn’t it? I’ve got the soil ready for tomatoes but will wait until Labour Weekend. I’m determined to grow enough tomatoes this season to make all my own pasta sauces & bottled tomatoes for the following year. At the moment we go through several tins of tomatoes every week (I didn’t grow many last year because I sowed white cosmos in the vege patch for the wedding instead). i am on year two with the seeds i got from kings,patience as next year is my cutting year. also brought some crowns they have shot up and are ready to flower. like the black out idea must try..
Patience isn’t one of my virtues, as you’ve probably noticed. But I sowed seed last year and was amazed how well they germinated. It’s definitely the cheapest way to get a big crop going in the long run. My ones turned 3yrs old now. 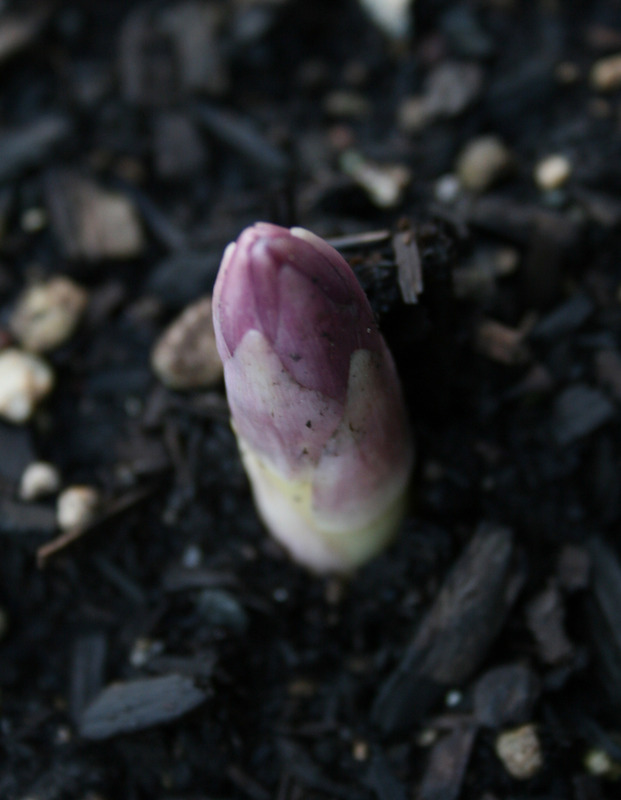 Only few days ago I saw the fat purple spears came above the soil. I haven’t got an asparague knife yet, am considering to get one in case I’m lucky enough to be able to taste a few this year! Start harvesting Lily. Cut the spears when they’re about 20cm long; if you bend them, they’ll snap naturally at the point where the sweetest part of the stem ends and the woody bit starts. I have only just discovered your blog after you put it in NZ Gardener. I love it. I’ve always enjoyed reading your articles. Always practical advice and humour (and lets face it we all need humour)….. I bought a bucket of asparagus from Bunnings last year when they were one year old. Will they be ok to stay in the bucket?? Or should they be eventually planted out? I have had two spears come up so far this spring. You could leave your asparagus in the bucket for another season but in the long run get the plants in the ground. Asparagus produces a crop for up to 20 years if well-fed and cared for. I too am out there counting my asparagus. I planted them two years ago and I should be rewarded this year with some. So far I have 15 asparagus poking their little heads through the soild. Lucky you! I’m only up to spear number two. Is it a practical proposition to plant asparagus crowns in pots? We are likely to move house in the next year to 18 months. But I have several half wine barrels and I love asparagus with a passion. I am also a patient person. If someone could tell me what asparagus crowns like to feed on and when to buy and plant them in my half barrels, I would happily brood over them until they were happy to present me with their delicious bounty. Good things take time.